WASHINGTON, D.C. -- NOAA’s Fisheries Service is seeking comment on a proposed rule that requires anglers and spearfishers who fish recreationally in federal ocean waters to be registered before fishing in 2009. The rule would also require registration by those who may catch anadromous species anywhere, including striped bass, salmon and shad that spawn in rivers and streams and spend their adult lives in estuaries and the ocean. The proposed rule satisfies the National Academy of Science National Research Council recommendations to establish a national database of saltwater anglers, and meets the requirements under the Magnuson-Stevens Fishery Conservation and Management Act. The proposed rule is part of a larger initiative of NOAA’s Fisheries Service to improve the quality and accuracy of data on marine recreational fishing and catches. The registry will also help measure the economic benefits of recreational fishing on the national and local economies. NOAA may exempt anglers from registration if they already have a state-issued saltwater fishing license or registration, and the state provides sufficiently complete information to place in the national registry. In certain instances, anglers in states participating in regional surveys of marine recreational fishing may also be exempted. The new rule allows states to apply for exemptions. 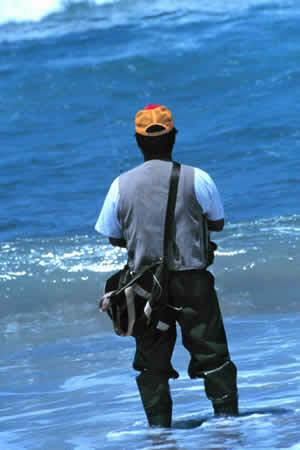 States on the West Coast (including Alaska), the Gulf Coast, and the South Atlantic offer saltwater fishing licenses. Hawaii and the states from New Jersey to Maine do not. Fishermen would be required to be registered annually and NOAA will not charge a registration fee in the first two years. Beginning in 2011, the annual fee will be an estimated $15 to $25 per angler. Anglers under the age of 16 would be exempt from registering and fees would be waived for indigenous people, such as members of federally recognized tribes. NOAA’s Fisheries Service recognizes that many indigenous people fish for food as part of ancient cultural traditions. Anglers who fish only on licensed party, charter, or guide boats would also be exempt, since these vessels are surveyed separately from the angler surveys. Also, persons who hold commercial fishing licenses or permits, and are legally fishing under them, will be exempt from the registration requirement. Registrations will include an angler’s name, address, telephone number, and the regions where fishing is conducted. This information will not be made public; it will be used only by NOAA to conduct surveys. The National Academy of Science’s National Research Council advised NOAA’s Fisheries Service in 2006 to redesign its surveys of recreational fishermen for more accuracy, precision, and transparency. The NRC’s independent scientific review resulted in more than 200 recommendations for improving marine recreational surveys, including the recommendation to establish a national database of saltwater anglers. This recommendation became law in the Magnuson-Stevens Fishery Conservation and Management Act, the primary fisheries law for U.S. ocean waters, which was reauthorized in 2007. Please see the Marine Recreational Information Program for additional information on this effort. For the last 28 years, NOAA’s Fisheries Service has conducted recreational fishing surveys through random telephone interviews with residents living in coastal counties. NOAA and its regional and state partners conduct an extensive program of dockside interviews of anglers to obtain data on their catch. The national saltwater registry will enable surveyors to interview only those people who fish, and will reach all anglers, not only those who live near the coast. To read the proposed rule, go to the National Saltwater Anlger Registry. Comments also can be submitted electronically.